1604 French settlers under Pierre du Gua de Monts and Samuel de Champlain settle an island in St. Croix River. 1605 Settlement moves to Port Royal. 1606 L'Order de Bon Temps founded by Samuel de Champlain. Arrival of Marc Lescarbot, renowned for his diaries describing life in Acadia. 1607 De Monts monopoly canceled. 1610 Poutrincourt comes to Acadia. 1613 English from Jamestown, Virginia attack, beginning the struggle between French and English for control of Acadia. 1621 English change name to Nova Scotia. 1632 French settlers under Isaac de Razilly settle at La Héve. 1635 French focus for settlement switches from La Héve back to Port Royal. Charles La Tour and Menou d'Aulnay fight for control of Acadia. 1654 British, led by Robert Sedgewick from Boston, capture Port Royal, La Have and a fort at the mouth of the Saint John River. 1667 Treaty of Breda under which England gave Acadia back to France, although it was not until 1670 that the actual exchange of control took place. 1671 1st official census registers Acadian population of more than than 400. 1672 Village Beaubassin founded by Jacques Bourgeois near present-day Amherst, Nova Scotia. 1680 Grand-Pré founded by Pierre Melanson. 1690 English begin repeated attacks on Port Royal. 1709 Birth of Charles Lawrence, the career soldier who ordered the expulsion of the Acadians in 1755. He was appointed Lieutenant-Governor of Nova Scotia in 1754. 1710 Final surrender of Acadia to the English Acadian population rises from 2500 to 8000 over next 39 years. 1713 Treaty of Utrecht; Birth of Edward Cornwallis, Governor of Nova Scotia from 1749-1752. Cornwallis founded Halifax in an effort to strengthen the British position. 1724 Mi'kmaq attack English at Fort Anne, but the English suspect Acadian involvement. 1729 Acadians sign conditional Oath of Allegiance under Governor Richard Phillips, who fails to inform Britain of this oath which does not require Acadians to bear arms for the English. 1745 Capture of Louisbourg by the English. 1749 Halifax established as British capital of Nova Scotia. 1755 Siege of Fort Beauséjour in June. In July Acadian representatives refuse to sign Oath of Allegiance. Deportation begins in August, first at Fort Cumberland (formerly Beauséjour), then Grand-Pré and later Annapolis Royal. 1764 Acadians permitted to return to Nova Scotia. 1766 Acadians return to Pubnico. 1768 Acadians re-settle at Clare. 1782 Acadians re-settle at Cheticamp. 1789 Nova Scotia Acadians regain the right to vote. 1810 New Brunswick Acadians win the right to vote. 1829 Roman Catholics given political rights in the Maritimes, allowing them to vote and run for political office. 1830 Prince Edward Island Acadians win right to vote. 1836 1st Acadian elected to Nova Scotia Legislative Assembly. 1847 Henry Wadsworth Longfellow's poem, "Evangeline" published. 1859 1st French-language study of Acadians undertaken by Edme Rameau of France. 1864 College Saint Joseph established in Memramcook, New Brunswick. 1867 Le Moniteur Acadien, French-language newspaper in the Maritimes, established. 1881 First National Acadian Convention held in Memramcook, New Brunswick. Our Lady of Assumption chosen as Patron Saint of Acadians. 1884 National Acadian Convention held in Miscouche, Prince Edward Island at which national flag and anthem are chosen. 1885 Pascal Poirer, Acadian lawyer appointed senator for New Brunswick. 1890 College Sainte-Anne established in Church Point, Nova Scotia. 1905 St. Mary's Church built. 1917 First Acadian Premier of Canadian province with Aubin-Edmond Arsenault elected Premier of Prince Edward Island; Fort Anne becomes a National Historic Site. 1928 Fortress Louisbourg becomes a National Historic Site. 1945 Joseph-Alphonse Bernard of Prince Edward Island becomes the first Acadian Lieutenant-Governor. 1961 Grand-Pré becomes a National Historic Site. 1963 Université de Moncton established. 1968 Centre d'etudes acadiennes established at Université de Moncton. 1971 La Sangouine, world-renowned novel by Antoine Maillet, published. 1973 Centre acadien established at College Sainte-Anne. 1977 College Sainte-Anne becomes Université Saint-Anne. 1979 Pelagie-La-Charrette wins French literary award for the story of a woman's ten-year trek back to Acadia after the expulsion. 1994 Congrès Mondial Acadien held in Moncton, New Brunswick. 1999 Congrès Mondial Acadien held in Acadie du Sud, Louisiana. 2004 Congrès Mondial Acadien held in Nova Scotia. 2009 Congrès Mondial Acadien held in thr Acadian Peninsula of New Brunswick. 2014 Congrès Mondial Acadien held in Acadia of the Lands and Forests. a) Acadia. The Canadian Encyclopedia Plus, CD-ROM. McClelland & Stewart, 1996.
b) Griffiths, Naomi. The Acadians: Creation of a People. Toronto: McGraw-Hill Ryerson, 1973.
c) Moody, Barry M. The Acadians. Toronto, Ontario: Grolier Ltd., 1981.
d) Quinpool, John. First Things in Acadia. Halifax: First Things Publishers, 1936.
e) Ross, Sally & Alphonse Deveau. The Acadians: Past and Present. Halifax: Nimbus Publishing, 1992. 1604 La Cadie, later called Acadie, is founded by the French in Nova Scotia. 1682 Robert Cavalier de La Salle claims Louisiana for France. 1699 First permanent French settlement in Louisiana established in Biloxi. 1713 Acadie is ceded to Britain under the terms of the Treaty of Utrecht. 1714 City of Natchitoches is founded. 1718 City of New Orleans is founded. 1719 First shiploads of African slaves arrive in New Orleans. 1755 Le Grand Dérangement begins and thousands of Acadians are deported. 1756 Poste des Attakapas is founded in south central Louisiana. 1762 France cedes Louisiana to Spain. 1764 First documented arrival of Acadians in Louisiana. 1765 Acadians settle at Poste des Attakapas. 1776 United States of America declares independence from Britain. 1785 Final Acadian migrations: Seven shiploads of almost 1,600 arrive in New Orleans from France. 1789 French Revolution brings waves of French immigrants to Louisiana. 1791 Slave revolt in Haiti brings more than 10,000 Creoles of French, African, and mixed descent to Louisiana. 1800 Spain cedes Louisiana to France. 1803 Napoleon Bonaparte sells Louisiana to U.S. for $15-million. 1809 Arrival of 5700 Francophone refugees fleeing revolution in Haiti. 1812 Louisiana acquires U.S. statehood. 1836 Vermillonville, later named Lafayette, is incorporated. 1847 Longfellow publishes Evangeline through which the world first hears about the Acadian diaspora. 1882 Railroad crosses Louisiana prairie, bringing more settlers and increasing the area's contact with the outside world. 1901 Oil is discovered in Louisiana near Jennings. 1905 Thousands die in Yellow Fever epidemic. 1906 Plaquemine Lock completed, allowing continuous navigation between Mississippi River and Atchafalaya Basin. 1916 Suppression of the French language in schools by the State Board of Education; "Les enfants sont punis quand ils parlent français". 1921 New Louisiana Constitution adopted, officially instituting the end of any public education in French, stating that "The general exercises in the public schools shall be conducted in the English language". 1927 President Coolidge visits a Louisiana ravaged by flooding. 1928 Louisiana Governor Huey P.Long begins extensive road-paving project. Joe Falcon and Cléoma Breaux make first recording of a Cajun song, Allons à Lafayette. 1929 Stock market crash, beginning of Depression. 1941 World War II begins, many young Cajun men serve as interpreters in Europe. 1947 First offshore oil well in the Gulf of Mexico. 1968 Conseil pour le Développement du Français en Louisiane is created. 1971 Edwin Edwards takes his Oath of office in French and English, becoming Louisiana's only French-speaking governor of the 20th Century. First Hommage à la musique acadienne, later to become part of Festivals Acadiens. 1976 Publication of Lâche pas la patate by Revon Reed, first book in Cajun French. 1980's Cajun music and food gain international recognition; c'est cool d'être Cadien. 1981 1st French immersion program in Louisiana started at La Belle Aire school is East Baton Rouge Parish. 1983 Calcasieu Parish begins an immersion program. 1989 Assumption and St. Martin Parishes introduce immersion programs. 1990 Census reports 668,271 Acadians/Cajuns residing in the U.S.; 61 percent are Louisiana residents. 1991 Louisiana State Legislature designates St. Martinville as the home of "The World Memorial to All Acadian Refugees Who Ended Their Exile in Louisiana". 1992 Lafayette Parish begins an immersion program. 1994 Acadia Parish opens an immersion program; the University of Southwestern Louisiana begins the first Doctoral program in Francophone Studies in North America. 1995 Consortium of Immersion Schools created. 1996 Orleans Parish begins an immersion program; immersion programs in Lafayette and Assumption parishes are greatly expanded. 1998 East Baton Rouge Parish reintroduces immersion. 1999 Entire state participates in FrancoFête, a year-long celebration of the tricentennial of the founding of the first French settlement in Louisiana; the second Congrès Mondial Acadien held in Louisiana in August, reuniting from all over the world the descendants of those deported from Acadia in 1755. Source: The above-noted was reproduced from "Le Petit Guide", published by the Counseil pour le Développement du Français en Louisiane, 1999. Before Acadie was founded, European traders and fishermen had already been visitors to these shores. A French presence was finally established in the New World in 1604, when in the early spring, a contingent of explorers, businessmen, and soon-to-be famous figures like Samuel de Champlain, Sieur de Poutrincourt, and Du Pont Gravé, left Le Havre, France, to assert their Kings claim to  l'Acadie. By the end of that summer they had explored what is today peninsular Nova Scotia, from LaHave to the Minas Basin, continuing along the northern edge of the Bay, charting the coast of present-day New Brunswick and Maine. These hardy souls wintered on Île Saint-Croix at the mouth of the St. Croix River, establishing the first European habitation in North America. In August 1605 Champlain moved to Port Royal (now Annapolis Royal), a community that was to become Acadias major town. In only a few years Acadian settlements spread throughout the Atlantic region. From 1632 until 1653 the core group of settlers arrived. Ownership of the Acadian colonies was tossed back and forth between the French and the English. Under English rule French settlement ceased between 1654 and 1670, and then under French rule settlements resumed. The first Acadian Census took place in Port Royal in 1671. One of the first in Canada, the total count was 392 people, 482 cattle, and 524 sheep! In the 1680s and 1690s many people left Port Royal and settled other areas. The Treaty of Utrecht ended the War of Spanish Succession in 1713, making the Acadians in Nova Scotia permanent British subjects, while Île Royale (Cape Breton) and Île Saint-Jean (Prince Edward Island) remained French. In 1719 work began on Fortress Louisbourg to protect Frances interests. It was to become one of the busiest ports on the Atlantic coast. By 1730, the majority of Acadians had signed an oath swearing allegiance to the British Crown, but they insisted they would not fight either the French or the native Indians. The establishment of Halifax in 1749 engrained a solid colonized British presence on the Atlantic Coast. By 1750 there were 10,000 Acadians in Nova Scotia. At the beginning of the French and Indian War of 1754, the British government demanded that Acadians take an oath of allegiance to the Crown that included fighting against the French. Most of them refused. Pressure from the English was strong. British Governor Charles Lawrence and the Nova Scotia Council decided on July 28, 1755 to deport the Acadians. Although Grand Pré to this day is the most well known symbol of the expulsion, it actually began at Fort Beauséjour on August 11. About 6,000 Acadians were forcibly removed from their colonies. The British military ordered the Acadians' communities to be destroyed and homes and barns were burned down. The people were dispersed among the 13 American colonies, but many refused them and sent them on to Europe. Families were torn apart and many lost everything they owned. Acadians call this event the Grand Dérangement, or Great Upheaval. In English it is the Expulsion. As a result of the deportation and the subsequent migrations, the Acadians ended up in the New England States and all along the eastern seaboard, as far south as Georgia. Many were put in jail, and many died at sea. Others ran away to Québec, hid with the Mikmaqs in Nova Scotia, or went to present-day New Brunswick, or Prince Edward Island. The expulsion did not end in 1755. Three years later the Acadians who fled to Île St. Jean (Prince Edward Island) and Île Royale (Cape Breton Island) were rounded up and sent to France. The British under General Wolfe and General Amherst recaptured Louisbourg, the last French stronghold, and deported 3,000 more Acadians to France. The Grand Dérangement displaced from 10,000 to 18,000 Acadians. Thousands more were killed. When France signed the Treaty of Paris in 1763, it gave Great Britain its colonial possessions in North America, except the islands of St. Pierre and Miquelon, off the coast of Newfoundland. British authorities in 1764 allowed Acadians to return in small isolated groups. They returned slowly, settling in various locations on mainland Nova Scotia and Cape Breton Island. Others ended up in Newfoundland, the West Indies and even the Falkland Islands. From 1765 to 1785 about 3,000 Acadians traveled from France to settle in Louisiana. Louisiana was then a colony of Spain, but the Acadians managed to retain their French culture. Their descendents, the Cajuns, continued to keep their language and lifestyle and became a major cultural influence. The Arrival of the Acadians in Louisiana by Robert Dafford. The famous American poet Henry Wadsworth Longfellow published Évangéline in 1847. It would eventually be translated in over 130 languages. The world discovered the tragic history of the Acadian people, as Évangéline became a folk hero. Although there were many regional differences, Acadians were able to maintain a distinct culture within a much larger majority. In 1864 St. Josephs College in Memramcook was founded and became the first higher educational institution in Acadia. In 1881 the first Acadian Convention established August 15th as National Acadian Day, and three years later at the second Acadian Convention, an Acadian flag, and a National anthem were adopted. There was discussion about important common issues like agriculture, emigration, and education. The Acadians of Nova Scotia established St. Annes College in 1890, today called Université St. Anne in Pointe-de-lÉglise. Other traditional colleges were started, especially in New Brunswick, ensuring that future generations of Acadians, would learn their language and culture. In Nova Scotia in 1901 there were over 45,000 people of French origin, almost 10% of the total population. The right to be educated in French and to have a French language media was a continuing struggle. Congresses met regularly, putting together an economic program and adopting political positions. Most of today's Acadians live in New Brunswick, P.E.I. and Nova Scotia, with some in parts of Maine and Quebec. While there are continuing struggles against assimilation and attempts to keep the French language alive, Acadians have increasing control over their education. In 1963, the Université de Moncton was founded and became the largest Francophone higher educational institution outside Quebec. In 1994 there were about 240,000 French speaking people in New Brunswick, 39,500 in Nova Scotia and 6,000 in Prince Edward Island. Others lived in Saint-Pierre and Miquelon, Gaspe, Magdalen Islands, and Newfoundland. The first Acadian World Congress was held in Moncton, New Brunswick. Acadians from throughout the world showed incredible interest in their family genealogy. 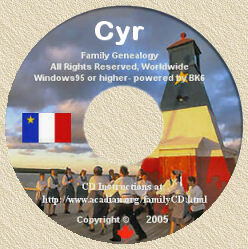 Numerous Acadian family associations were born and started to comprehensively research their ancestral origins. The Acadian Museum of Prince Edward Island and the Archive Centre of Pubnico West in Nova Scotia, among others, offer extensive historical and genealogical resources on Acadian families. Université de Saint Anne, and Université de Moncton both also have centres for Acadian Studies. Research into their past and connections to each other continued to be made at the World Congress in 1999, held in Lafayette, Louisiana. Acadia lives on in many small communities spread along throughout the Atlantic region. The nuances in the accents, developed through contacts with other cultures, are noticeable from one area to another, from the Acadian Peninsula in New Brunswick to St. Marys Bay in Nova Scotia. There have been attempts to have the Grand Derangement officially recognized. In December 2003, the federal government agreed to issue a proclamation in the name of the Queen recognizing the wrongs the Acadians suffered during the deportations. The year 2004 marks the 400th anniversary of the founding of Acadie, and the establishment of the first French permanent settlement in North America at Saint Croix Island. Acadians have focused their hard work and entrepreneurial skills on strengthening their institutions, their commercial enterprises, and their educational establishments. Acadians have worked to create an identity different from that of France or Quebec. Their culture today is bustling with amazing energy, artistic creativity and joie-de-vivre. The 4th Acadian World Congress (CMA 2009) was held from August 7th to August 23rd, 2009, in the Acadian Peninsula, in northeast New Brunswick. The World Acadian Congress is a huge gathering of Acadians from all over the world. It takes place every five years. It was a unique occasion for the residents of the Acadian Peninsula to showcase themselves to the rest of the world, as well as the perfect opportunity to meet with cousins from far away. The CMA 2009 was also a meeting place for family reunions, outdoor concerts, thematic and community events, and popular and scientific conferences. In short, the CMA 2009 showcased a huge line-up of activities for all tastes and all ages, spread over the entire territory of the Acadian Peninsula. The countdown to 2014 is, on with the announcement that northern Maine - together with neighboring regions in New Brunswick and Quebec - has been selected as the site that year for the Acadian World Congress.